This photo was taken by Mr Meshal Allogmani from Makka, Saudi Arabia. His bees are busy building honeycomb. The first comb in the background looks normal, but the one in front is amazingly different. I think the appearance is due to the wax being extremely transparent, so we are seeing the structure on the other side. But to me it looks oddly like snowflakes—white, delicate, and six-sided—not deserty at all. If you follow the links, Mr Allogmani has posted several more photos and a cool YouTube video of his bees working inside the hive. 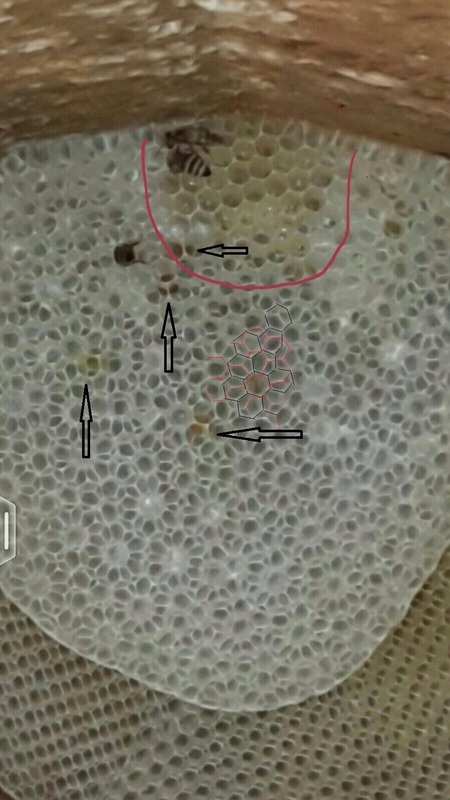 The beekeeper and his friend who sent the photos, Abbas Aldahri, are wondering if anyone else has seen comb like this and what may be the cause. They are both familiar with this subspecies of honey bee, yet never saw comb like this before. What do you think? This honeycomb appears to have a strange pattern. © Mr Meshal Allogmani from Makka, Saudi Arabia. Aren’t they just the most amazing insects! How beautiful this is. May I put a link to this in our club’s bee bulletin? Thank you!! Sure Donna. And I agree, they are truly amazing. It’s a desert, perhaps they are making a little wax go a long way. The cell walls look very thin. I believe you are right that the pattern is caused by the transparency of the comb. If you look carefully, the cells on top are in normal rows and the transparency gives the interesting pattern from the cells on the other side of the comb. Pretty cool! I’d be tempted to cut that one out & save it. I see from his other video that they also have varroa mites over there. Very interesting Rusty! It appears there is a larger center cell with smaller cells around each one. Like a flower with petals. Is it possible that this bee specie builds a special type brood comb? Could the larger cell be for future queens and the surrounding cells for her nurses? It is mostly empty but it would be nice to see the same comb after the bees fill it. I agree it would be nice to see it filled. The only reason I don’t think it’s a species trait is that these beekeepers always raise this species, and they have never seen it before. It will be interesting to see what all of the front comb looks like when the cells are filled and capped. I’m also curious about the bees’ behavior in the video: they appear to be frantically trying to avoid the light. Is that usual? Interesting observation. Don’t know the answer to that. Possibly a genetic defect (maybe in the sight) of that particular generation of honey bee comb builders. The comb starts off normal then changes to the strange pattern (perhaps as different bees have taken over). The comb looks unusable as they have stored honey only in the normal sized cells in the middle. Or maybe they are affected by the heat after all! I also believe it is to do with the thickness of the wax, and more importantly the depth of the cells so far constructed. If you look more closely at the cells near the top of the comb, a cell side wall structure can be seen and the pattern is not so easy to see. As you look lower you will realise that you are looking at the very base of the newly laid wax, much as our foundation sheets are, with little drawn comb on them yet. I would be very interested to see another picture a few weeks on, of the same section of comb. I think it will progress into more normal looking comb. Either way it is really stunning to look at. Very interesting and beautiful is that young brood I see? I am like the others I would love to see it filled. Certainly interesting. This photo immediately reminded me of Mudejar Style. Have a look of some of the photos here. They look like comb, and some look like this comb! Did anyone think to ask what they’re foraging, to produce such a pale, clear wax from the honey? Looking carefully, it is clear that there’s nothing but two normal combs of hexagonal cells, superimposed to create the snowflake effect. As proof, the tessellation is not 100% consistent but depends on the angle of the overlay to the eye of the viewer. You can reproduce the effect by layering two pieces of new chicken wire. Bees never stop amazing me. I noticed that there is little or no propolis or field staining on either the walls of the hive or the comb. That may be contributing to the transparency of the comb. It appears that the bees may have built a foundation that is a little uneven. If you greatly enlarge the photo, you can more easily see that the cells in the snowflake pattern actually ARE hexagonal, and that the corners of the hexagons from the other side are what’s causing the illusion. And speaking of pictures, Rusty, what kind of camera and lens do you use to get your amazing pictures? Could they have gotten into something? I remember a study with spiders once, where they were exposed to ?LSD or another hallucinogen, and their webs were out of kilter. As you described, it’s very translucent comb and the snowflake effect is seeing to 2 sections of comb. It appears that the picture was taken from an angle slightly above the comb sections, not directly straight ahead. Pretty cool. It reminds me of moire patterns… maybe worker comb on one face and drone comb on the other? Two different sizes of a regular pattern, interacting in a rhythmical way, giving that regular spacing of the ‘snowflake’ configuration wherever the two center cells line up. This picture was explained last week. Open the picure and see the lines of each cell. The comb is very transparent. The black lines are from above but the red from down. The reason most beeks in the US do not see this is because they are using foundation in Lang hives. We see this view all the time in foundationless where we allow the bees to draw their own comb in the frame, guided only by a starter strip placed on the underside of the top bar. The very fresh, new comb is much more transparent because there is not the artificial wall of wax (or plastic) foundation sheets. Also, the wax will vary in color depending on the nectar source. This fall, with the onset of Schinus terebinthifolius (Brazilian Pepper tree) the combs have been bright lemon yellow. Mid-summer, they were a light brownish-pink. Mr Allogmani is not using foundation, obviously. The bees’ combs have the appearance of a naturally drawn comb we often see in the cutouts we do in Los Angeles, with a curvature to the bottom edge and a generally oval shape. Bees have been drawing their own wax comb for 70 million years without us showing them with foundation how to do it. Do you know of anyone keeping a top-bar hive and putting foundation in it? Ask the top-bar folks what their combs look like…..much like the photos here. side add to the snowflake effect. Best as I can tell, the bees transitioned from drone comb to worker brood on both sides creating this unique look.